CRUNCH: As the King of The Seven Seas, Aquaman has sunk to a few depths in his time. Now the crew at letsbefriendsagain have chosen him for the latest of their humourous continuity explaining strips, Comics Everybody! From bloodthirsty sea-horses to Aquaman's various hand attachments, catch all the funny right after the jump. CRUNCH: For a flightless bird, fellow 'Kiwi' Karl Urban sure gets around. Lord of the Rings, The Bourne Supremacy, then Star Trek - now, Judge Dredd in the upcoming 3D film. To be shot in South Africa by the makers of District 9 later this year, the gritty film will remain true to the icon - Dredd will NOT be removing his helmet. jump. CRUNCH: All six Star Wars movies are jumping to Blu-ray in 2011. Blu-bonuses include deleted scenes like one leaked online but quickly removed earlier this week. 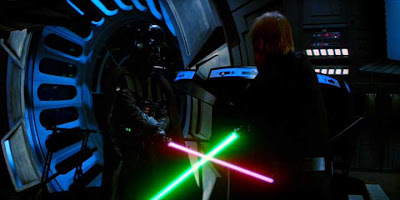 Still, if you'd like to see Luke turn his lightsaber green as Darth Vader reaches out from afar, you can still spoil your Return of the Jedi Blu-ray-wait, right after the jump. I was totally excited for the new Return of the Jedi scene. Now rumor is that it's faked. Thanks for that Shag - I actually thought when I looked at it Luke's face was a little different! !